I’m not going to be falsely modest and say it was nothing. That would probably be irritating, but it would also be dishonourable to what we have created here. Because 1000 Voices Speak For Compassion is amazing, and every morning since I suggested it in a Facebook group, I wake up feeling astonished and grateful for how so many of you have embraced it. Again, I’m not going to pretend: there have also been mornings when I’ve woken up feeling exhausted, anxious or sad, because my family has had a huge amount of turmoil since January 12th, when this all began. But in that, the 1000 Voices Speak For Compassion group has been a Godsend, something to focus on other than grief, somewhere to go for support, and something that just has helped me feel buoyed up and enthused whenever I thought about the amazing things that were happening. It’s not stopping here either. Many people are already asking, “What’s next?” The plan just now is to keep this going on a monthly basis, with each month having a theme, and some having two or more themes, that people can either chose to write about or not. We don’t want to exclude anyone from writing about compassion just because one month’s theme doesn’t fit with their knowledge or experience. 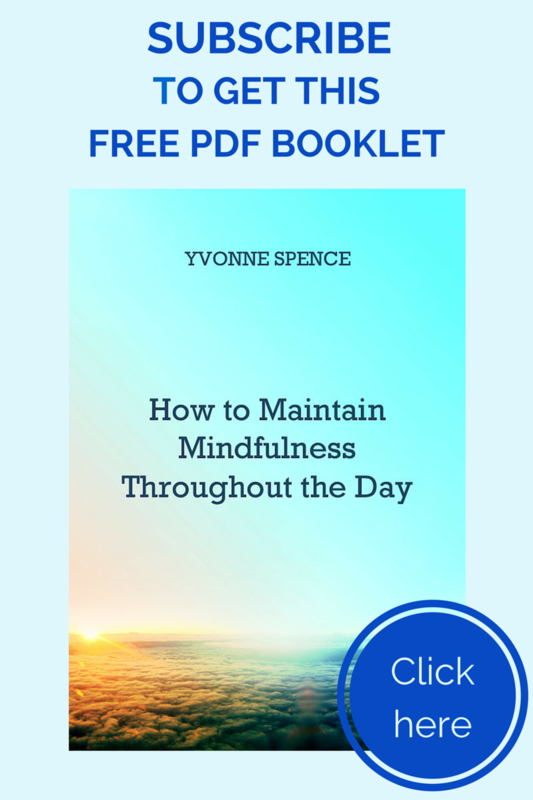 The themes will be chose to coincide with world events – so for instance in April some people would write about compassion for nature in honour of Earth day. It’s also Autism Awareness month, so some people would write about that. You could also think of the themes as inspiration for anyone who isn’t sure what to write about – this shows that in no way are they compulsory. This first day, 20th February was chosen to coincide with UN World Social Justice Day and some people chose to highlight that in their posts, but many didn’t. Another, related, theme emerged because several people, including me, chose to write about the homeless. Many others wrote about self-compassion. The themes will also have another purpose, which is as yet in the very early stages of planning – so I won’t explain it yet, but stay tuned! So, this was never about one day, and it was never about one or two people either. I know Lizzi Rogers, whose post, We All Need a Village, I was reading when I had the idea, who was the first person to say yes, and who has been involved in a big way right from the start, feels the same way I do, that this not our group, not our thing, that it belongs to everyone. The idea on its own would have been nothing if nobody had said yes. It would have been nothing without the willingness of people to join the Facebook Group, to be admins there and on the page, to run the Pinterest board, to set up a blog for people without blogs, to set up a Google Plus Community, to make a video, share on Twitter. It would be nothing without the willingness of people to share their expertise, about social media, Linkie link-ups and so many other things. It would be nothing without you. So I want to introduce you to some of the amazing and generous people who have been working behind the scenes, supporting Lizzi and I as well as you. The first person to say yes to being an admin on the Facebook Group was Roshni, of American Indian Mom, and she has been amazing in this role, and on the Facebook page. Time after time I’ve seen someone has asked a question and when I go to answer it Roshhi has got there first. Thank you Roshni! As well as admining, Jen St Germain Leeman along with Leah Vidal set up the blog #1000Speak to spread the word to take submissions from non-bloggers. Other enthusiastic admins and recruiters for 1000 Voices Speak are Katie Paul, of Head Heart Health, and Gene’o Gordon of Just Gene’o, and Gretchen Weber Kelly of Drifting Through. Every time someone says Gene’o is a social media expert, he says he’s not, so I won’t call him one. But let’s just say without his input #1000Speak would not flooding Twitter and we’d be making a much poorer job of getting the word out in general. Gene’o, his sister and others have also been amazing at sharing posts every weekend. Many of you will have seen the wonderful video Tamara Woods of Paper,Pen,Pad made, but if not here it is again. (You can skip past the first minute or so if you like! Seriously, I’m still trying to get used to seeing myself on screen, and will be taking lessons from Tamara because she is either a natural or very practised!) The video was a huge undertaking and Tamara did a brilliant job. So did all the wonderful people who recorded clips, explaining what compassion means to them. While we’re on the video, I want to mention Dave Listwa, husband of Lisa from The Meaning of Me. Lisa is full of enthusiasm for 1000 Voices and recruited Dave to do the music for Tamara’s video. Dave’s website is here. Christine Carter had a great idea to find out where in the world everyone came from and to make it into a graphic. Once she’d got everyone, Crystal Cook of The Quiet Muse, then stepped in to bring this brilliant idea to life and you can see the result below. Marcia Shaw Wyatt of Blogitudes realised that although our Facebook group was going great, not everyone has an account and since she is experienced on Google Plus, she set up and runs a community there. 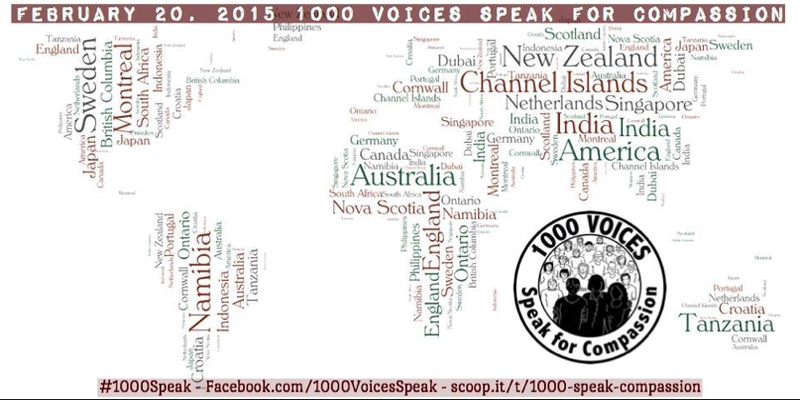 So if you are on Google Plus, you can join 1000 Voices Speak For Compassion. Early on I started a Pinterest board, but I’m not much of a pinner and very quickly floundered. Sarah Nilson Martin, of Me Plus 3, very kindly offered to take over instead. You can find the group board here. Many, many of you have done an amazing job of reaching out to others and encouraging them to join in. Thank you all for that. Kristi Campbell of Finding Ninee runs a weekly blog hop, Finish the Sentence Friday, and since compassion is a cause she has been promoting for a long time with her Our Land series, she got everyone from her blog hop to write about compassion and join our hop. Pooja S Mulleth of Ilirian Ravings is another who worked quietly to encourage many, many people to join in. I’m immensely, intensely and insanely grateful to each and every one of the people I’ve written about here. Their enthusiasm and encouragement kept me going. The logo here and at the top of this post, as well as in many people’s social media avatars, was designed by my friend Pam Bennett. As well as being a friend who has been there for me through all sorts of situations for around 30 years, she is a graphic and textile designer. She was right and I’m glad she spoke up. Thank you Lizzi. It’s been amazing. We’ve all done a great job, so THANK YOU!! And remember, it’s far from over! Oh Yvonne you are so sweet to include me! I’ve had such a great time working on this project with you and all the other admins and participants. I’m so happy for its success and even happier that it will continue! Jen, of course I had to include you. You have done so much! And yes, I am so, so happy with how it’s gone too, and that it will go on… It’s been great to meet you. Yvonne this has truly been amazing and the people I have met have been just as amazing. You are so sweet to mention me. Erin, same as I said to Jen – I had to include you, you did so much too! Thank you! It is amazing isn’t it? So many wonderful people coming together and they are still joining. Brilliant job Yvonne. And well done for accepting the role Lizzi pepped you into. I don’t underestimate how much effort and energy you must have put into this. Well done. Time to put your feet up – for a while. Thanks Geoff, and thanks for joining in and recruiting people too! As for putting my feet up – comments to answer, blogs to read and a lot of stuff to sort out before I can make a big announcement! 🙂 But I love it all! It’s so wonderful to be doing this. I think I’ve found my niche in life! Amen! to everything you wrote. I am grateful for everyone also. This was/is an important project to me and I feel honored to have been a 1K blogger! Thank you! Kathryn, thank you for taking part! Every single person is a star and I am so grateful to everyone! Thanks very much, Yvonne. I am so happy I discovered this early and was able to help it along. I say I am not a social media expert because I actually am not. On October 1, 2013, I had not one single social media account and knew nothing about it. I am working my way toward expertise, though, and when I get there, I will certainly accept that title. It’s the #WeekendCoffeeShare linkup that my sister Diana runs that really allowed me to help this along. That usually gets about 25 links shared on the weekend, and a lot of those bloggers mentioned #1000Speak in multiple coffee posts. That and I got a guest-hosting gig for #SundayBlogShare on Twitter at just the right time. If you’re not a social media expert, sir, you’ve got the charisma and presence online. I gathered very quickly from your Twitter feed and then your posts that you’re wielding leadership skills here. I say “leadership” as to a person that greases the wheels, oils the cogs, and maintains movement forward. It’s not all pep rally and motivational speeches, y’know? I do know, and you are right. Somewhere in my archives there is a post in which I talk about how, if you look at only page views, I am the least popular blogger that publishes at Sourcerer. And I say in that post, I have no problem with that, because I am the grease in the wheels, and it is a role I enjoy. Lead by example is my rule. I never tell people to do things, and rarely ask them to. Tell people what I am doing and invite them to come along. That’s how I lead. Gene’O I am also very happy you discovered it early on because your knowledge has been invaluable.. Thanks for your sister’s name – I’ll add that to the post. Thanks again! Jaklumen, thanks for that! I am not sure about the videos, but I am learning from Tamara and also my friend Mike Pugh who does a lot. so glad, Lizzi. you were there to nudge Yvonne along, to be the leader of this flock of wild geese for a while! Yes, it has been a little bit like being part of the flock of wild geese, honking to each other for support. I assume you, and Yvonne, and everybody will know that this is what geese do: taking turns in cutting the wind waves at the front, spurned on by the call of the flock, encouraged and nurtured, until, naturally, for another while, somebody else is taking their turn. Yvonne, reading your post here, I can feel the village, I can see the village, I can start to believe in the village. Thank you for flying strong. Your wings are ever stronger now. Thanks weaver, you sweet you! I love that you see and feel the village. I love the geese image too. And the analogy of geese taking turns as leaders. And yes Lizzi, I am smiling at the idea too! Oh this is grand – and thank you for the mention of me and the Hub. We are truly honored to be part of this. Can’t wait to see where we go next! Lisa, it’s been great getting to know you better during this! Thank you to you and your husband both for your great contributions. this is a great post to finish off. I really wish to thank you all listed above. I have found this past month to be the most inspiring for myself since I began blogging exactly one year ago now. I always like to write posts about compassion, so when this came along it was a natural fit and I just had to join. I can be suspicious, sometimes, of these sorts of things, but I feel there is a real need for compassion and writing and blogging has a real chance to influence the world in the area of something good for a change. I use certain days like how this Friday is Rare disease Day. Any day that is important to me I write about on my blog so I am thrilled that is how we will be going forward. I am excited to hear what else might be in the works. Kerry, I am so pleased to see that you have had a great time with this. I took a look at your blog and you have been great at promoting it, so Thank You for that! This was wonderful to read. I’m so honored to be on a list of such wonderful people, who want to make the world a happier place. I know there a lot of people involved, but seeing it spelled out like this, is wonderful. Over this past few weeks, my village has exploded. Thank you for starting this Yvonne. It’s such a wonderful project and I can’t wait to see where we go from here. They are wonderful people, and so are you Tamara! “my village has exploded” – what a great phrase! I’m really excited about our new plans too. Thanks so much for all your work. And I loved your post! I have been so abundantly and undeniably blessed to be a part of this beautiful coming together of hearts and minds. I’m honored and humbled to be in the presence of so much *goodness*. It’s not often I find myself at a loss for words, but I kind of am. Until I can find them and properly compose them in a manner that expresses my complete gratitude for this phenomenal movement you’ve created, I will simply say thank you . . . to you and Lizzi both. Thank you. Thank you so very, very much. I second Lizzi’s hugs Crystal. If that’s you at a loss for words, then your lost words are beautiful! You are one of the people whose comments in the group make me feel so glad we started this. It’s so wonderful to see how it touches people, to know we are making a difference, even now. *blushing* it was an honour to be a part of this and to help out as much as I could! ! Thanks to all of us for making this an incredible experience! Roshni, you are a star! Really. Thank you Katie. Like you, I have enjoyed watching the compassion unfold. And I think we’re all shining stars, everyone in the group. Yvonne, to my chagrin I’ve only just made it here (yes, not having slept yet) and this is awesome. I really appreciate that you’ve taken the time to thank everyone who was involved with this, and that you’ve done such a wonderful job of leading the group (you li’l goose-herder, you!) and taking the idea from a bit of a pipe dream into something real and tangible with a life of its own. I think that you hit a tipping point, and I’ve been astounded at how this thing has snowballed outwards around the globe, and quite honestly, I feel undeserving of as much accolade as I’ve had, but I’m honoured and humbled and SO loving being a part of this. It’s perfect and gorgeous and a beautiful kind of messyglorious I’ve not seen before. I hope it thrives for a LONG time to come. It has the feeling of something which matters. I think it’s making a difference. Well done you. And well done us 🙂 And well done ALL of us. Ha, ha, Lizzi, that image of herding geese is going to stick around a while I think! I agree that we hit a tipping point – I’m sure of it. This undeserving thing is a conundrum. Was just talking with a friend who felt that way about something today. It’s a feeling, probably unrelated to anything that’s going on now, partly just a human reaction, but one that some of us have more than others, depending on our childhood experience. I have it in buckets at times too, and yet we are neither undeserving or deserving. It’s just what it is. I like Weaver’s idea that, like geese, we take turns to lead. This seems to be our turn, so we might as well fly with that! Ah, these geese!! And yes, well done all of us. This IS amazing, on so many levels. The people are those special people that the universe sometimes sends along JUST when we really need them, a reminder of how wonderful humans can be. The good people are out there, sometimes they are difficult for me to find. THANK YOU for creating a place where they are so easy to find! Lizzi has affected me on a personal level I could not have predicted. She changed the way I feel about blogging, about writing, about relationships with human beings you’ve never even met in person. I was ready to stop blogging, to stop trying, to stop putting goodness out into a world that needs it so badly. She saved my blog, and let me keep my creative outlet on MY terms, and that is something I don’t know how to repay. Other than pushing myself to participate in these types of events, and keep the movement MOVING. I look forward to all the future days, dates, topics and goodness! Joy, wow, it is so wonderful that Lizzi affected you so much in such a positive way. And I love what you’ve written here – yes we created a space where so many good people can so easily be found. Thank you for that definition! It’s wonderful. We created a space, that’s all, and that’s perfect! Thank you for joining us to speak about compassion. Ahhh, but you ARE amazing, Yvonne! And we’ll just keep saying it! You and Lizzi! ALL the admins AND participants of this incredible movement of Compassion – each and every one – ALL with such generous hearts, excited about giving something good to the world via #1000Speak – ALL bright shining stars! It has been a true blessing to be part of this group and its purpose. It’s been a tremendous pleasure! It’s been a learning and growing experience! I’m so excited that we’re not done – that February 20th was not the end! Thank YOU for the very kind thank you and your willingness to go forward! You ARE amazing, Yvonne! I’m so excited that we aren’t done too! And to have you on board helping out is wonderful. Thank you! Thank YOU (ALL of you) for making this happen. Ilirianwander, thank you for taking part!